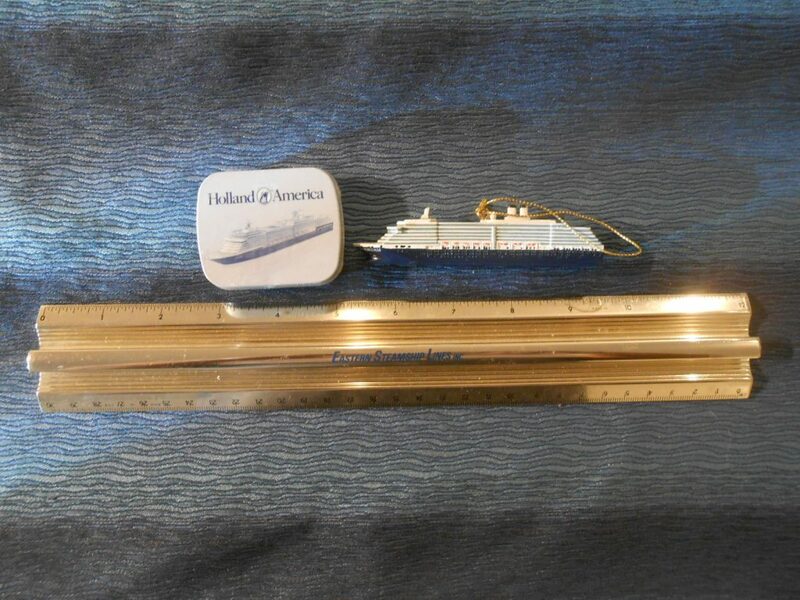 2 little items from the Noordam: The first is a lovely Holiday ornament perfect for your tree or use year round. 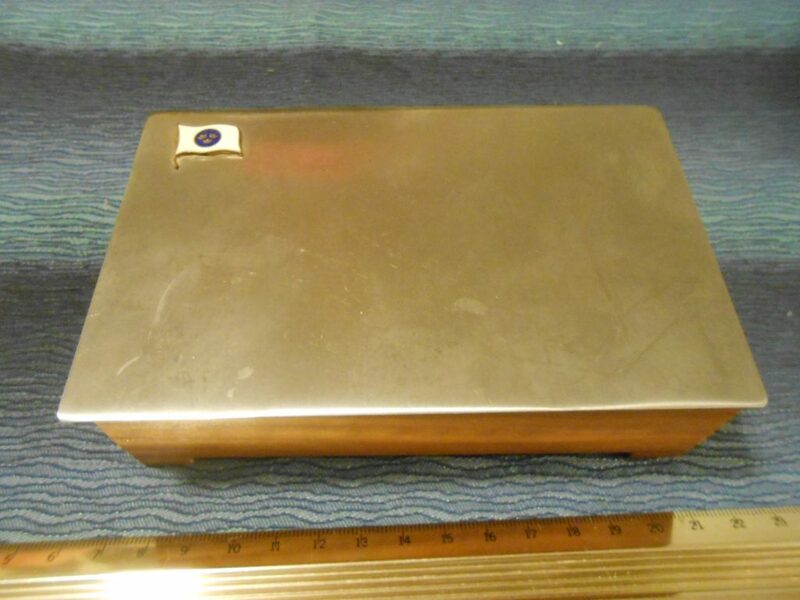 The second is a little tin box of Ooster Mints … sealed and never opened. 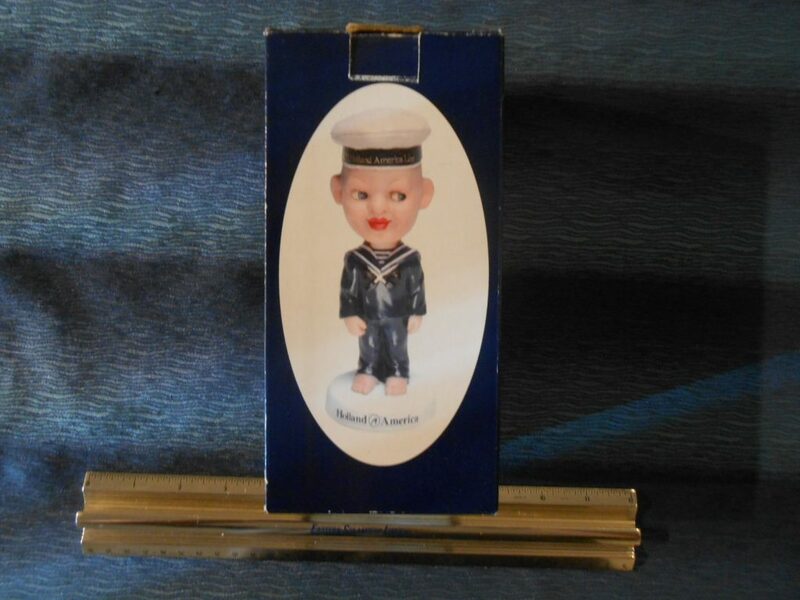 Lovely souvenir Bobble head doll … these were all the rage in the Late 90’s and early 2000’s. still boxed and bagged. 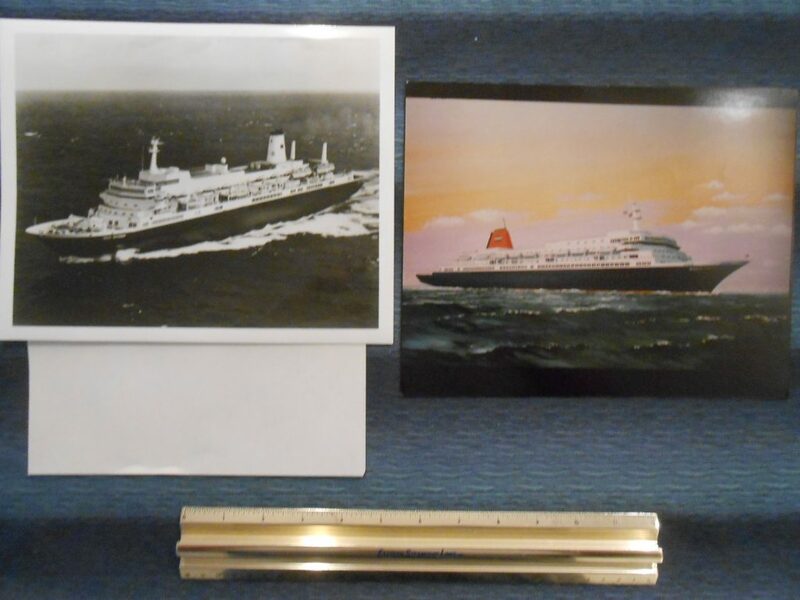 The first is an early artist rendering … the second is a lovely photo of the ship when brand new. Perfect condition. 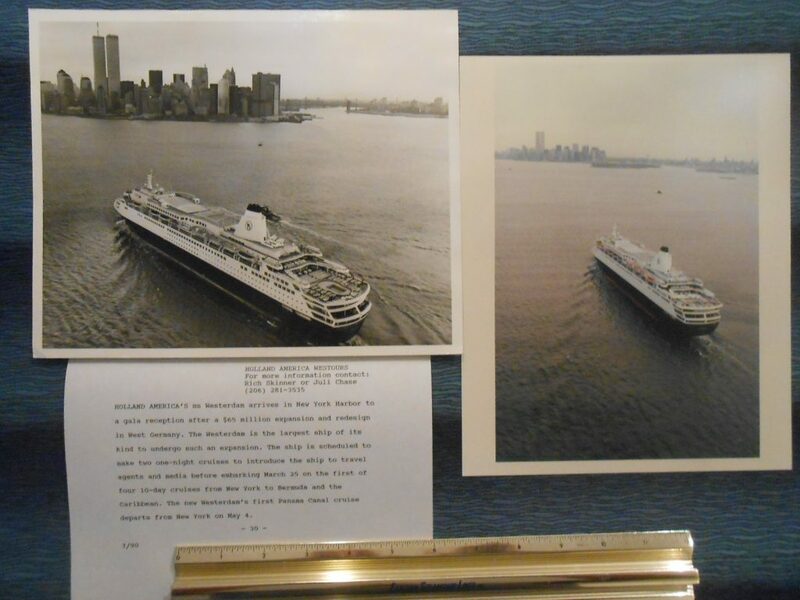 HAL Westerdam: 2 NYC publicity arrival photos March 1990. The ship had just undergone a $65 million dollar upgrade and refit. Excellent condition. 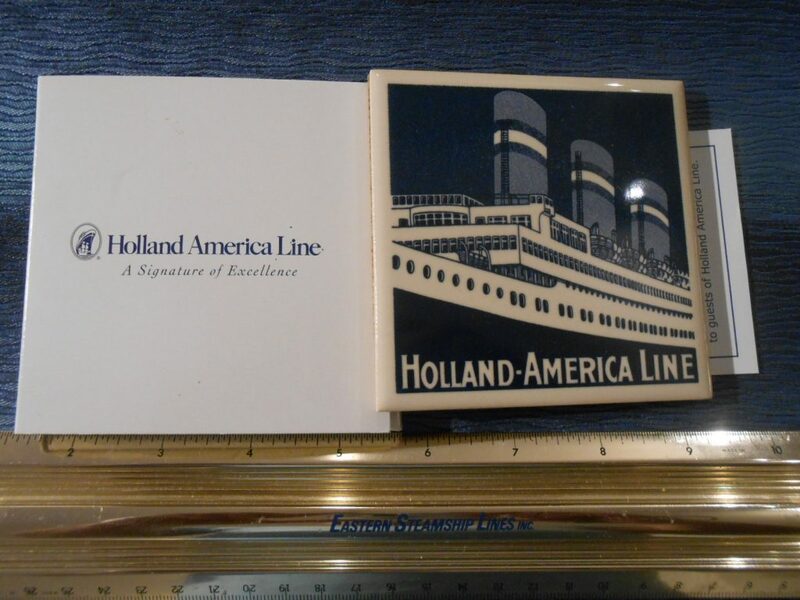 Great Tile Coaster showing the 1930’s Statendam. Lovely Coaster in it’s original Cardboard holder. 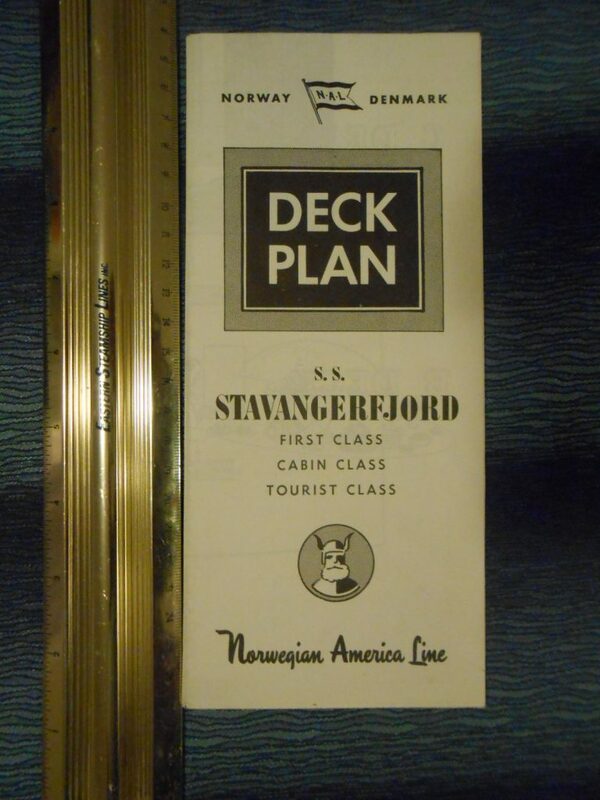 I have always loved this ship … and NAL did a very nicely detailed deck plans for all of their fleet members. This plan appears to never have been unfolded and has a California agency stamp on the rear cover. Excellent condition. Super simple little blue directory for the Lovely Statendam done after her “Cinderella” refit. A few little scuffs and erase marks. Nice fold out for the last new SAL Liner: Kungsholm. 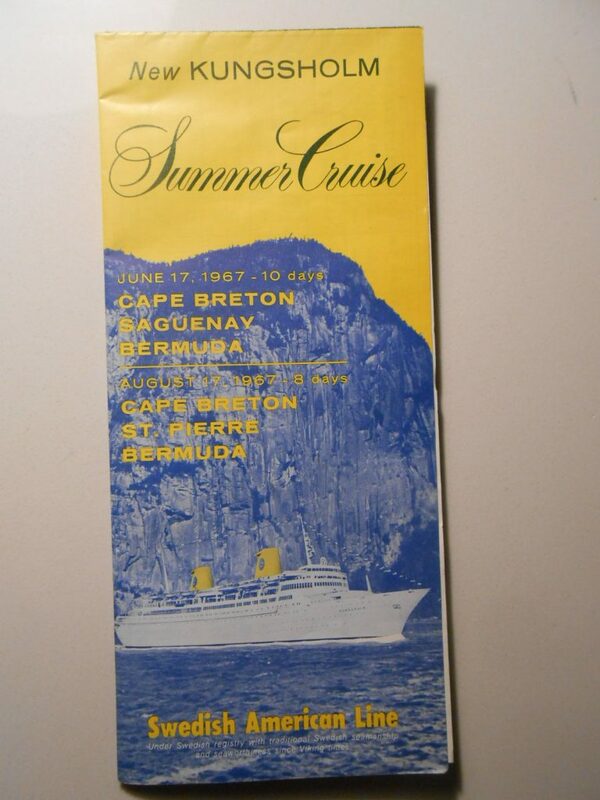 Great deck plan with a few interior photos with some information on the Canada/ Bremuda cruises. The ship had a very long life and like most finished at the scrapyard. Lovely interior fold out for these little Spotless twins! At the end of their Dutch years … One went to the Greeks and the other to the Poles,both had long lives . 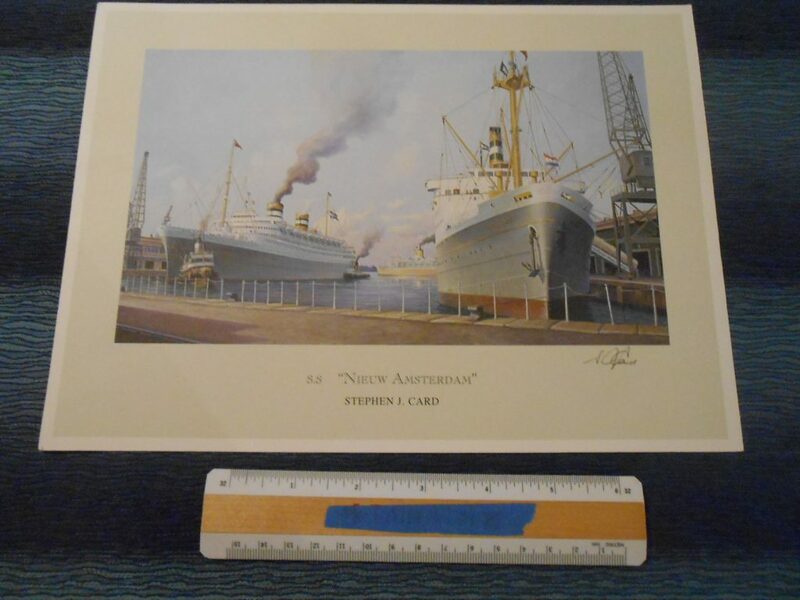 Lovely color photos and in excellent condition. Agency stamp 1960. 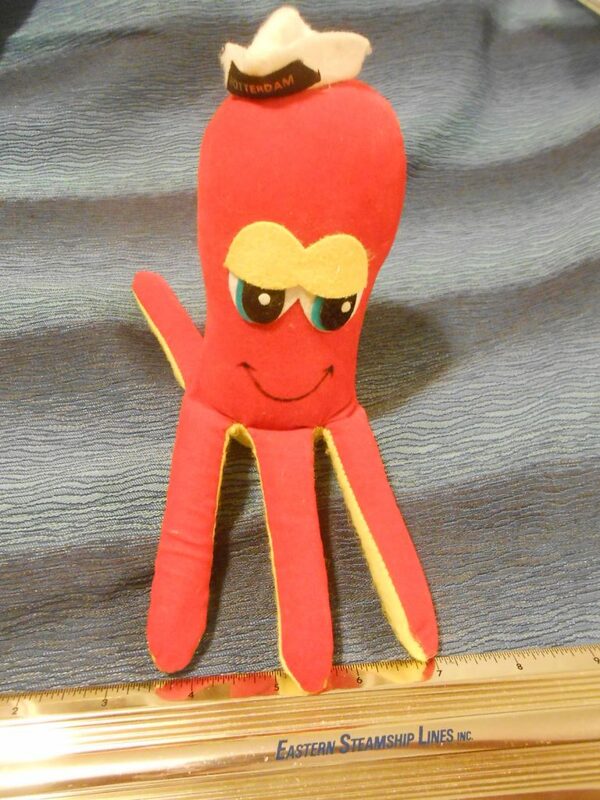 Not sure why this little “Octopus” souvenir doll only has 6 legs … it is quite odd. In great shape and maybe of a nice smooth velvet like material. I do prefer this little doll to the scary “Nora Welling’s” type dolls. Looks at those loving Octopus eyes! 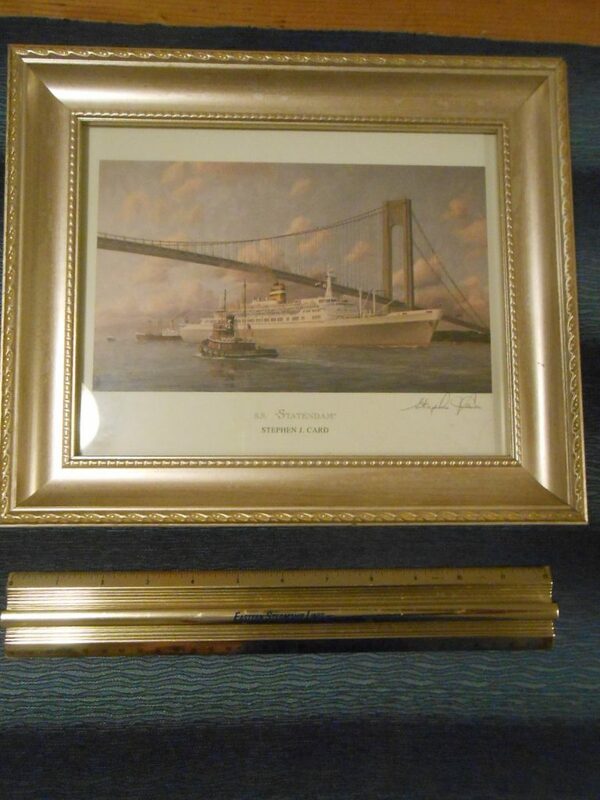 Outstanding framed print by Stephen Card as she passes under the Narrows Bridge. A Moran tug has come to greet her and at least one other vessel passes far to stern. Lovely and beautiful colors … it looks to be on a semi cloudy fall day as the ship arrives. The frame is well done and in good shape with minimal wear. The print is also signed! All class (First, Cabin and Tourist) for the ancient Stavangerfjord. Though older than the hills by the 1950’s she was well maintained and had a loyal following offering a true “time gone by” experience. The plan is in excellent condition. 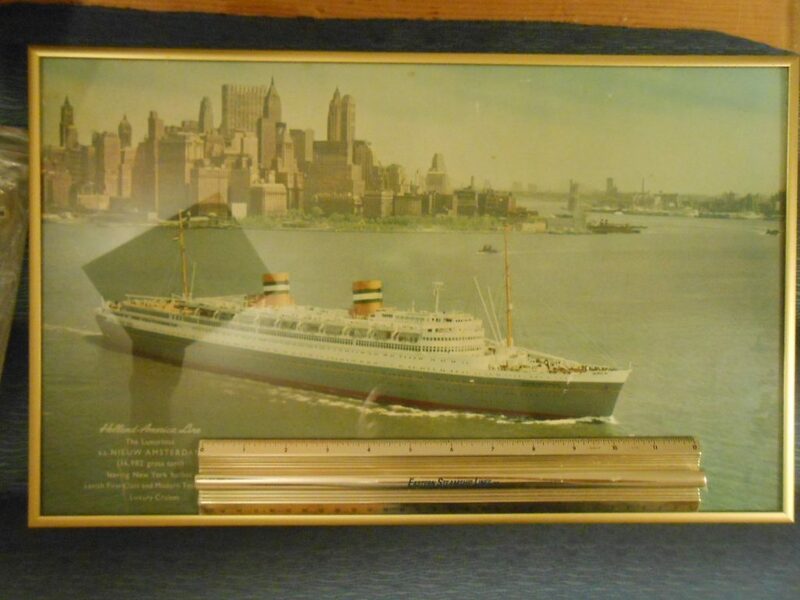 Outstanding agency view of the Nieuw Amsterdam headed out of sunny NY Harbor at the start of another crossing. Certainly my favorite Dutch Darling ( as I have said many times). Great print under glass. Slight wear buy over all superb! Pardon my reflection in the glass. 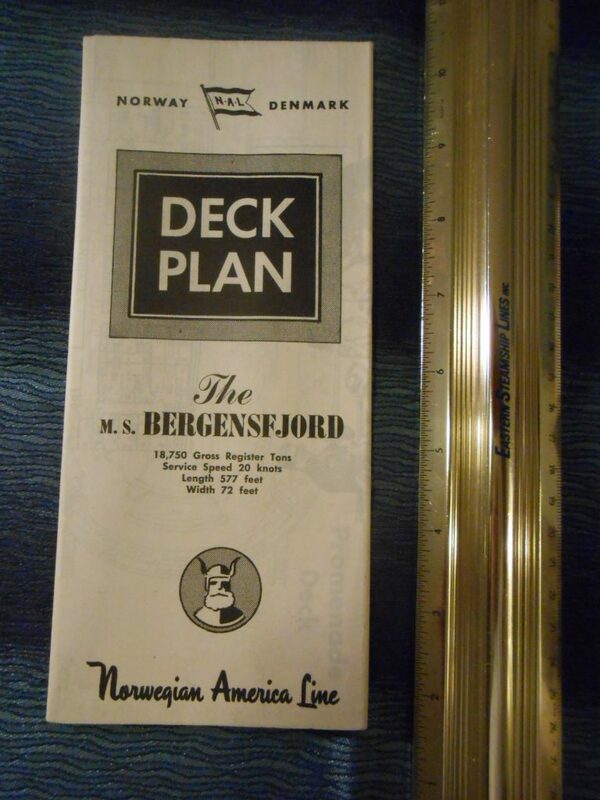 Excellent interiors folder for the darling Nieuw Amsterdam .. Probably my favorite Dutch Darling of all time. Sadly, she was well worn and aged by the time he left for the Taiwan breakers in the early 70’s. The fold out is in Excellent condition. 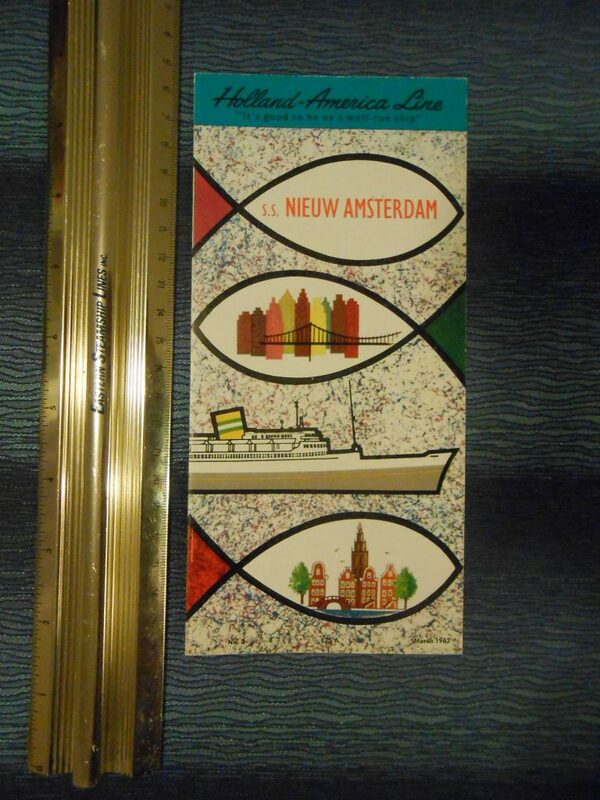 Excellent interiors folder for the lovely Rotterdam. 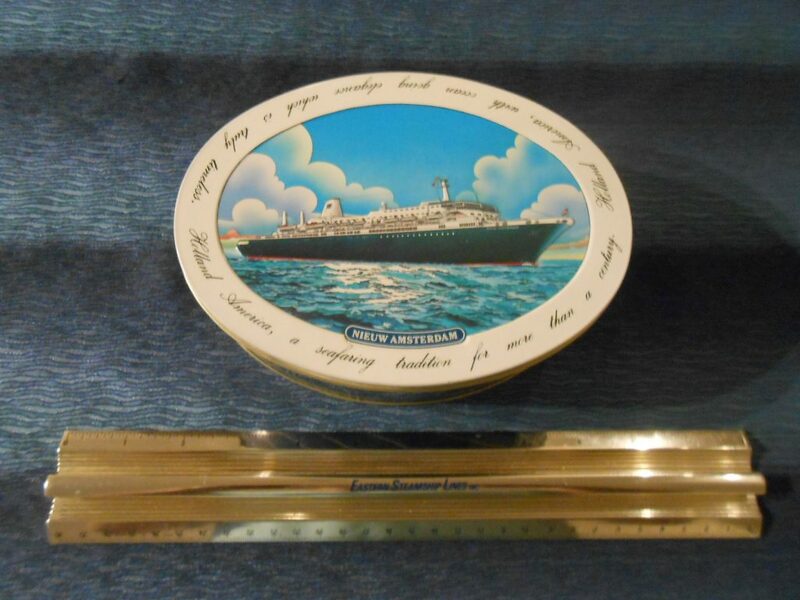 Most of the spaces shown in the photography still exist today .. a must see for anyone interested in Vintage Ocean Liners! Excellent condition. 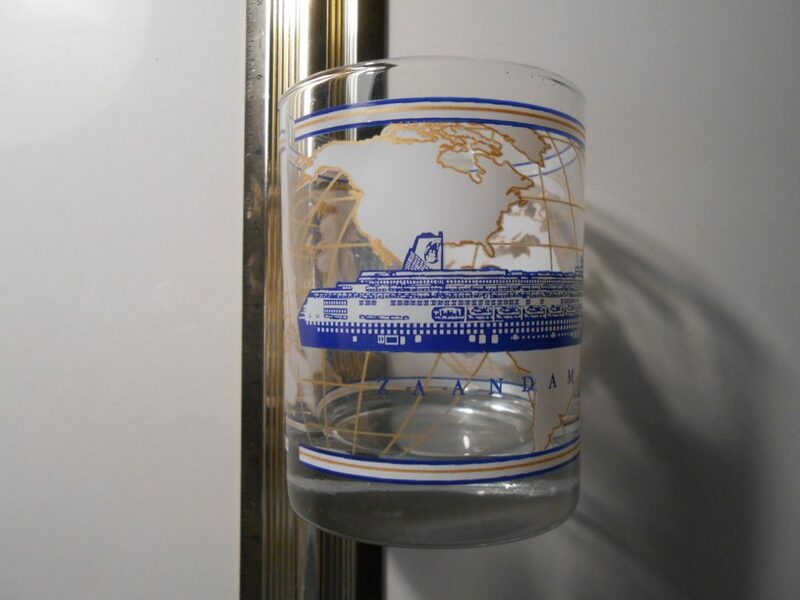 Great and brand new Tumbler for a current HAL ship. As I type this, It looks like the ship is in Glacier Bay Alaska! 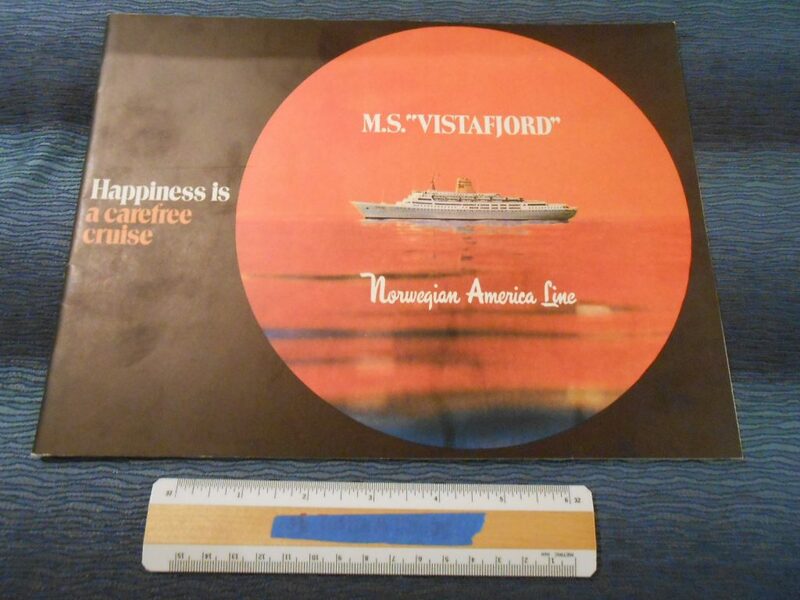 Tag lined: Happiness is a carefree cruise … lovely early brochure for NAL’s last ship. Filled with interior renderings and deckplans … this one is superbly done and for such a beautify lady! outstand 70’s graphics. 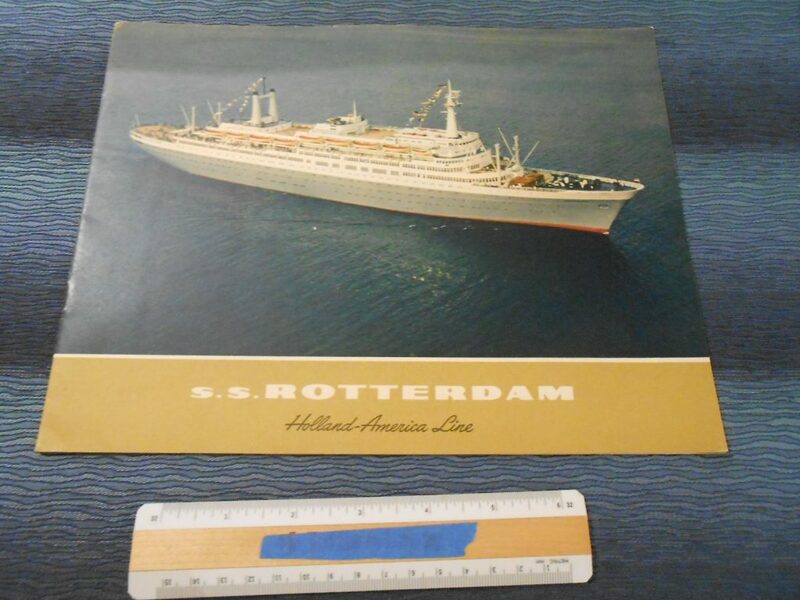 The best and most wonderful brochure ever done for HAL’s last true flagship … the 1959 Rotterdam. Filled with photos of her glorious interiors … most of these rooms still are pretty original today. Pristine and like new condition! Don’t miss this one! 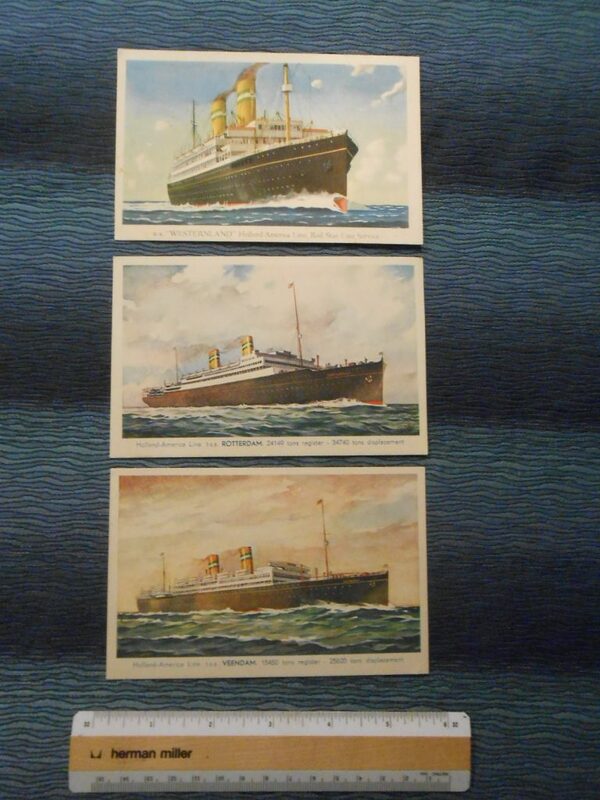 HAL: 3 Interwar postcards Veendam, Westernland and Rotterdam. 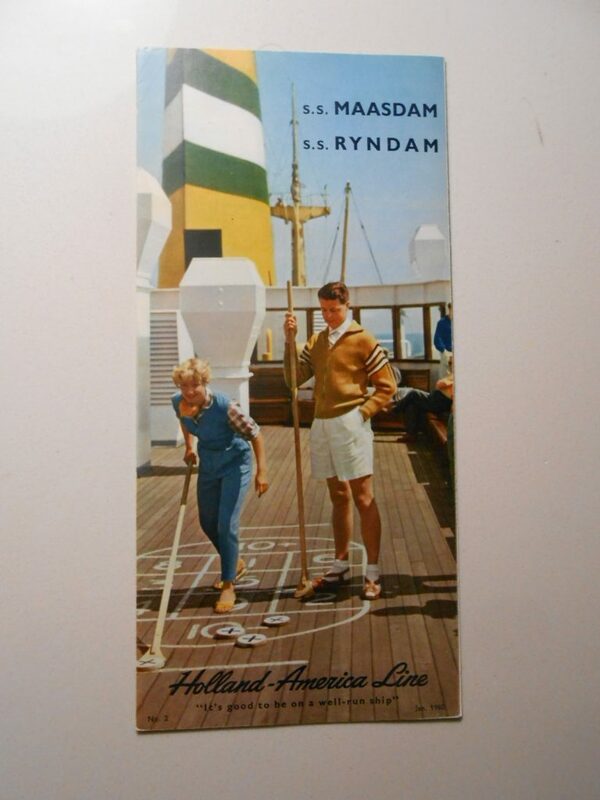 3 lovely unused Interwar postcards for the HAL Veendam, Westernland and Rotterdam. These are in great unused condition. 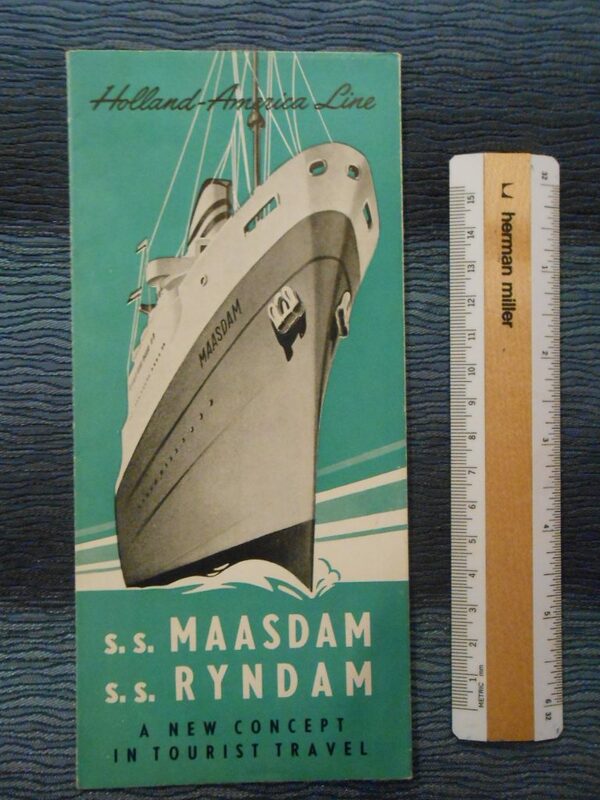 Only the little Veendam would comeback into service after WW2. 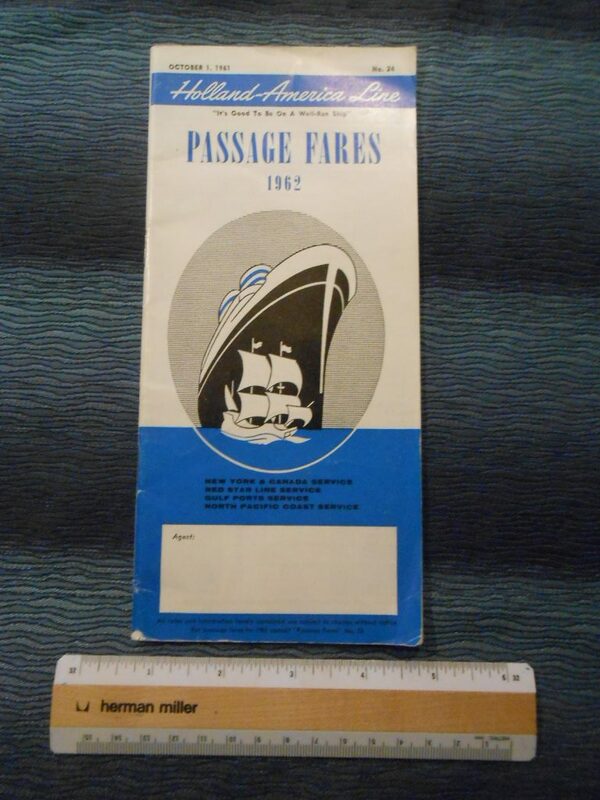 Nice little rate folder for the HAL 1962 season .. released in October of 1961. 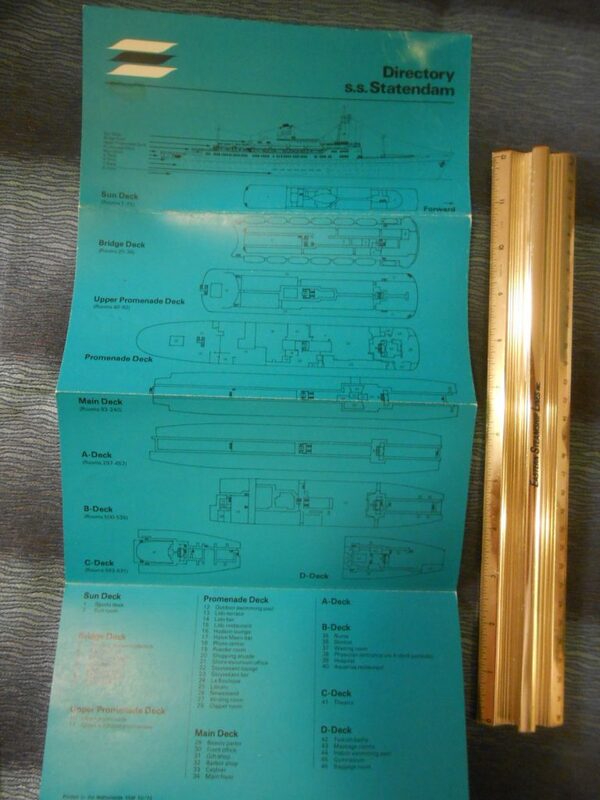 Interior folder for HAL’s 2 original post war experiments .. slower steady ships with lots of tourist space. The b/w. 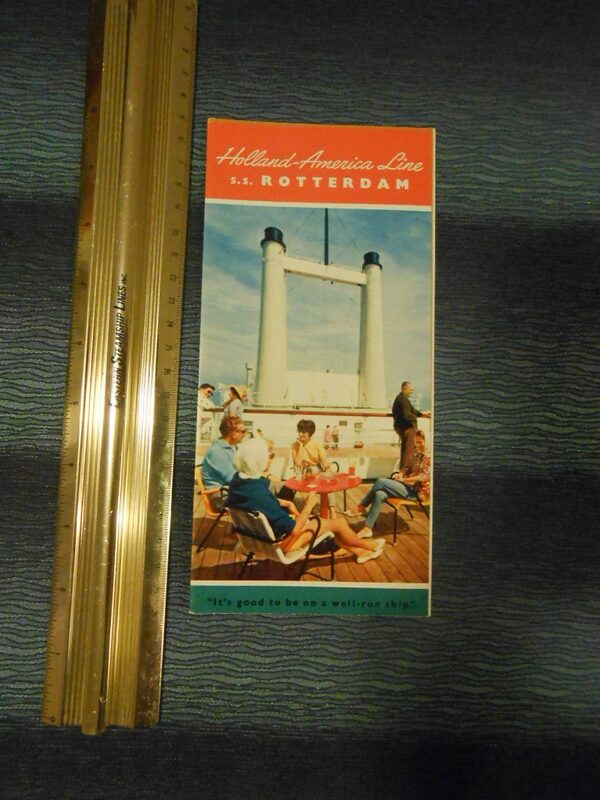 photos of interior space are lovely … these ships would have made HAL a lot of cash .. and certainly influenced both Statendam and the later Rotterdam.. Greta little fold out in super condition.